In this post I will take you 'behind the scenes' of one of my recent Patagonia images. 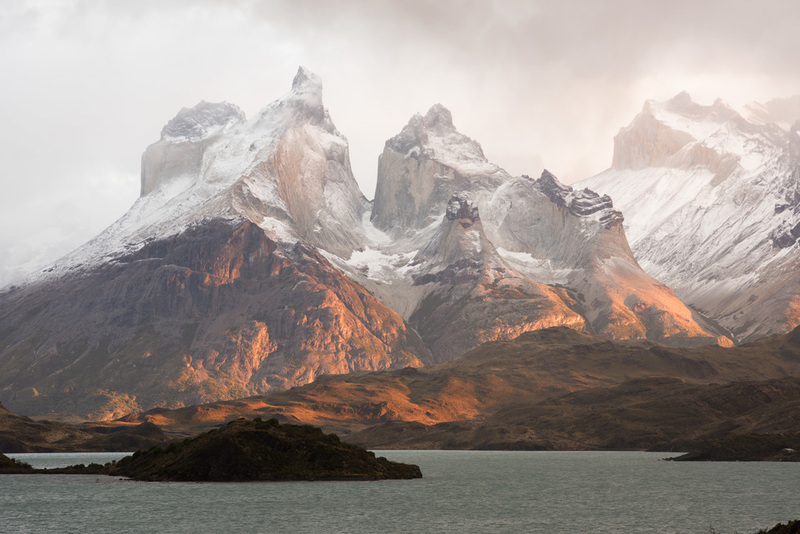 This photograph was taken in one of the world's finest national parks for landscape photography - Torres del Paine. I will show you the location, how I captured it in the field and some insight into the post-processing techniques used to deliver the final result. 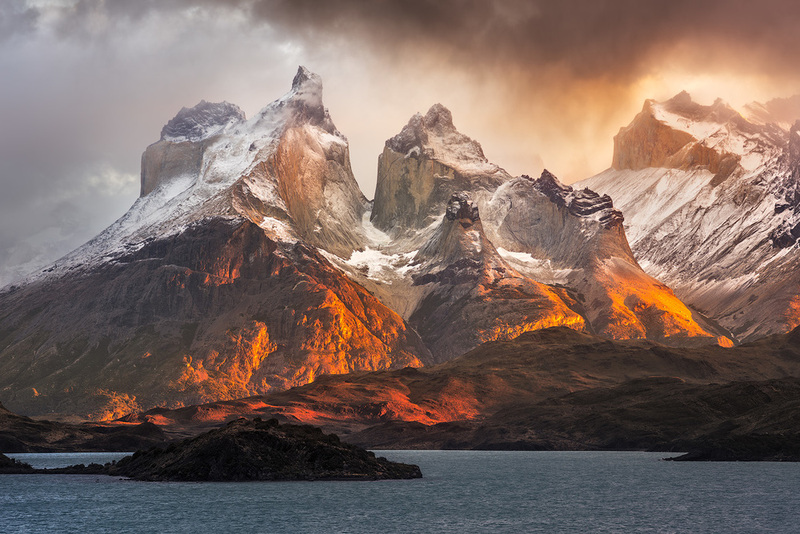 The image of the Horns of Paine (Cuernos del Paine) in Torres del Paine National Park. This shot was taken early on in my second trip to Patagonia very close to the Lago Pehoe Campground. The Pehoe Campsite is a pretty decent place to spend the night actually - you get hot showers, flushing toilets, an (expensive) restaurant, access to a store selling basic supplies and usable, albeit slow, WiFi access at night. Not to mention - unbeatable views only metres from your tent. To take this shot, I was standing on an elevated position behind the campsite - there is a path which leads around the lake and up the hill to this location, but I have also marked it in the embedded map. The morning started off looking pretty grim and gloomy and I didn't have much hope of walking away with any decent images. It had been snowing heavily on the peaks overnight and this is another factor which makes this particular image special in my mind - snow doesn't tend to last that long on these peaks in March; in fact within a day or two it had almost completely disappeared, save for the small amount that always seems to be there. Eventually, and somewhat to my surprise, the sun did manage to break through the cloud and cast some glorious light over the Paine Massif. I think the light was accentuated by the inclement weather conditions hovering around the peaks themselves at the time too. I happened to have my telephoto lens on at the time the light hit, and I was glad to be standing where I was; I was able to quickly compose my shot, and fire off a few before realising I had forgotten to use EFCS mode and that shutter vibrations would likely have caused issues at this focal length. I corrected the mistake and kept shooting. The image was captured on a Nikon D810 using a Voigtlander 90/3.5 APO-Lanthar SLII, at 1/5s and f9.0, ISO64. No filters were used. Electronic first curtain shutter was important to ensure optimum image sharpness; given the shutter speed of 1/5s at this focal length to not use it would have ensured some, possibly all, of my shots would be blurry. Not long after the image was taken, the rain started again and came down hard - the morning was done, but at least I managed to walk away with an image I was happy with. Achieving the look I wanted for this image took some time. Although I was able to capture the full dynamic range of the scene in one file thanks to the impressive capabilities of the Nikon D810, reviewing it on the computer made me think that I'd probably get the best results from "triple processing" the RAW for tonal control. That is to say, applying an exposure modification to duplicates of the base RAW file and blending them together to give me a more balanced tonal curve. When performing the initial RAW processing - contrast, CA removal, saturation and so forth - it was important to pay close attention to the impact White Balance has on the scene. In camera it was shot at a temperature of 5500 (set to Daylight); usually I don't fuss too much about WB in-camera since it is easy to fix later. I actually really liked the cold look that 5500 achieved; it felt very fitting for how gloomy the morning was. But what if it was warmed up significantly? I bumped the WB up to around 13500 which added considerable warmth, and something of an ethereal feel to the scene. The comparison on the left shows the difference white balance can make to how a scene feels. Bear in mind - this is straight out of camera, aside from a WB adjustment to the warmer image. After finalising my RAW adjustments, I synchronised them across the duplicate files mentioned before in Adobe Lightroom and made manual exposure decreases to two of the three images; retaining the brightest (as shot) and making incremental decreases in exposure in the duplicates. I then loaded these three files into Photoshop as a stack and blended them together using luminosity mask techniques. With my blended image I had achieved a more balanced tonal range in the scene, and a great base layer on which to start making further adjustments and refinements. All told the final image is about a dozen layers. I used a luminosity selection on the sky to give it a little more pop with a targeted curves adjustment, and a global curves adjustment was used to add back in the contrast lost through the blending process. Further adjustments included some selective dodging and burning, additional brightness adjustments to the darkest areas of the scene (again using luminosity selections to control the area of these changes), a slight adjustment to the colour balance in the shadows (it seemed too magenta) and other minor tweaks. I fixed up the water - I preferred it blue, which is how Lago Pehoe actually looks, not the green that it came out to be after making the white balance adjustment, so I corrected this with a colour balance adjustment layer, masking out everything except the water and finally cloned out the little chunk of land you can see protruding into the frame on the bottom right corner. At this stage, the image was 'done' and I saved my layered PSD file as well as a flattened TIFF. All that remained to do was to resize and sharpen for web, and from that you can see the final output below. You can view the full 'before and after' of the image using the slider widget; from straight out of camera to final frame. I hope you have found this useful or informative!